It’s March 1981. In the six months since the last blog post, the biggest news is the murder, in December, of John Lennon. Also, Michael Foot is elected leader of the Labour Party, prompting thirteen members of its moderate wing to quit and form the SDP. While in Doctor Who, Tom Baker’s made the headlines by announcing that he’s going to quit the show at the end of the current season. I used to dislike Logopolis, feeling that its focus on the technicalities of non-volatile bubble memory, charged vacuum emboitments and block transfer computation were a pretty dull way to write out an actor famous for his hatred of ‘bafflegab’. But I can see now that I was quite wrong. All of these technical details are incidental to the story Christopher Hamilton Bidmead wants to tell, a lot of vamping to conceal the truth. Because this is actually a story about Doctor Who’s future turning up and forcing Tom Baker to relinquish his grip on the series. Doctors have had premonitions of their imminent ends before. The first Doctor worried that “This old body of mine is wearing a bit thin” in the last episode of The Tenth Planet, and the third Doctor knew full well that returning to the Great One’s crystal cave would destroy him. But never before has the next Doctor turned up four episodes early to chivvy his previous incarnation into the grave. The first time we see the next Doctor in this story, he’s watching new companion Tegan Jovanka and her aunt Vanessa from the roadside where his predecessor has parked the TARDIS around an actual Police Box. The old Doctor apparently plans to measure it so he can arrange for the people of Logopolis to help fix the chameleon circuit. But he’s troubled, disturbed by the departure of his friends Romana and K9, and by the return of the Master. He’s further perturbed by the Cloister Bell’s clanging chimes of doom, which signify some wild catastrophe. While the old Doctor worries about his broken-down vehicle, the new Doctor watches Tegan struggle with a flat tyre. The first person to spot him is Auntie Vanessa. “I thought I saw a man hovering over there,” she says, hopefully. “Perhaps he needed a wave of encouragement.” Then the old Doctor pops his head out of the TARDIS door and, having glimpsed his replacement, rubs his chin thoughtfully as further disturbing possibilities start crowding his head. In Part Two, after an abortive and desperate attempt to flush the Master out of the TARDIS, the old Doctor arrives by the banks of the Thames. He spots the next Doctor beckoning him from a bridge. “Nothing like this has ever happened before. I’ve got to get to the bottom of this,” he tells Adric. The two Doctors talk, and the old Doctor’s fate is sealed. “I’ve just dipped into the future,” he says, fatalistically. “We must be prepared for the worst.” He sets course for Logopolis – previously the very last place he said he wanted to go. But, as he tells Adric, they are in danger from a chain of circumstances that fragments the law that holds the universe together. What does this mean, exactly? Later, the old Doctor warns the Master that he is interfering with the law of cause and effect. From this, we can deduce that the next Doctor has turned up before the events that led to his creation. But there’s more to it than that. The next Doctor isn’t just hovering about, an insubstantial Watcher. He’s guiding events, creating the very circumstances that lead to his own arrival. The minute the fourth Doctor speaks to his successor, and takes his advice to go to Logopolis – presumably because the next Doctor has warned him about the consequences of the Master’s interference – he’s signed his own death warrant. It’s a classic self-fulfilling prophecy. The fourth Doctor has to go to Logopolis to stop the Master’s plan so that he can become the Doctor who tells himself to go to Logopolis to stop the Master’s plan. Meanwhile, the next Doctor continues to manipulate events, collecting Nyssa from Traken and lurking in the shadows of the vast, crumbling streets of the city at the end of the universe. After the ominous, cryptic pronouncements of the first two episodes, Part Three makes the stakes clear – the whole cosmos is teetering on the edge of destruction. Since the Time Lords and the Guardians failed, it’s fallen to Logopolis to try to prevent the inevitable collapse of the closed system into disorder and entropy. Through reckless villainy, the Master, quite unwittingly, has condemned the whole of creation to death. Even he can’t quite believe it. It’s certainly not what he intended. This is all the lead-in to one of the best-ever cliffhangers: the Doctor and the Master forced into a last alliance to prevent the imminent apocalypse. It’s preceded by a bitter outburst from the old Doctor, in which he turns on Nyssa, Tegan and Adric and claims they forced themselves on him. They’re not even his companions – they belong to the next Doctor, whose whole era is arriving four episodes too soon. Dismissing them all, the old Doctor places them in the care of his next incarnation, waiting inside the TARDIS – because even the Ship has now been appropriated. The old Doctor has nothing left. Headstrong as ever, Tegan defies the Doctor and remains on Logopolis. But Adric and Nyssa hide in the TARDIS with the next Doctor, who then takes the entire Ship out of time and space to escape the cataclysm. The Doctor beckons to Adric. He wants to talk to him. We never hear what’s said, but Adric says he knows what’s going to happen. From this moment on, everything depends on the old Doctor playing out his pre-ordained role in this tragedy. Back on Earth, now, the old Doctor and the Master go through their final paces. Of course the Master is going to try to double-cross the Doctor. Of course the Doctor is going to foil him. That’s as pre-destined as the paradox of the next Doctor. I think the really sad moment in Part Four, the moment when Tom Baker’s magnificent Doctor realises his time really is up, is when he looks through a window at the Pharos Project and spots the Watcher standing in the TARDIS doorway, practically tapping his wrist. It’s Wilf knocking four times; it’s Davison spilling the bat’s milk; it’s Troughton kissing Zoe on the forehead; it’s Colin getting on an exercise bike: the moment we know the inevitable end is coming. A few minutes later, as the fourth Doctor hangs from a power cable, staring in fascinated horror at his impending death, does he contemplate the way his future has trapped him in this moment? As the next Doctor’s team gaze up at him, dangling from that gantry, waiting for their time to begin, are they secretly willing the old man to release his grip, wondering what happens to the causal nexus if he decides he’d prefer to hold on? Does the fourth Doctor fall, or does he let go? “It’s the end. But the moment has been prepared for,” he says, with a final grin. It’s a moment that’s been prepared for since the first episode. For all Bidmead’s pseudo-science and the Master’s black hat villainy, Logopolis was really all about making it impossible for the fourth Doctor to stay: surrounding him with the fifth Doctor’s crew and ultimately making the restoration of cause and effect dependent on him sacrificing himself so the future could be be born. Nyssa has the last word. “He was the Doctor all the time,” she says solemnly, as the Watcher takes his fallen predecessor into himself. The line is notable, because it’s different from the reprise in Castrovalva (a surprised, “So he was the Doctor all the time!”). 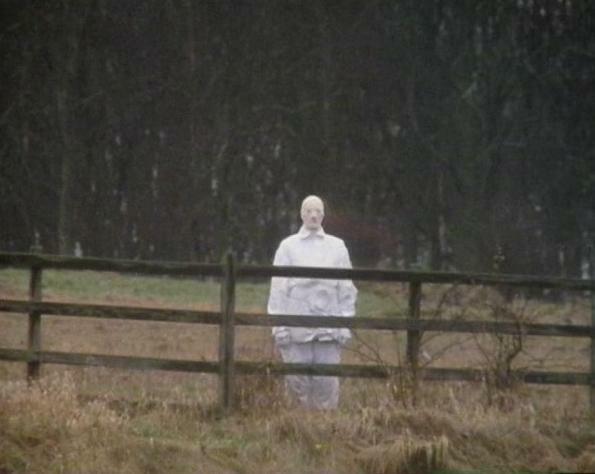 In Logopolis, the line sounds more like a clarification – we should have been paying more attention to this weird figure dressed all in white, because he’s the real leading man in this show. The funny old guy with the scarf was just hanging on beyond his time, until he realised the universe had already moved on. Next Time: “You know, I loved being you. Back when I first started at the very beginning, I was always trying to be old and grumpy and important, like you do when you’re young. And then I was you.” The Doctor plays a perfect fifth in Kinda.